Law enforcement is essential in combating wildlife poaching. Despite their vast size, tropical forests are surprisingly sensitive to disturbances within the ecosystem, and the demise of keystone species, such as forest elephant, can cause the decline of many other species. For this reason, effective law enforcement is essential in ensuring the fragile balance is not disrupted through illegal activities such as poaching for bushmeat. The ranger recruitment, selection and training process began with the independent evaluation of the rangers already working in the park. Those that did not fit in with the selection criteria were redeployed, while the others went through additional training to bring them up to the required level. Additional rangers were recruited from the surrounding communities, and through the ‘Poacher to Protector’ programme which saw ex-poachers receive amnesty for handing in their firearms and declaring any previous illegal poaching activities. 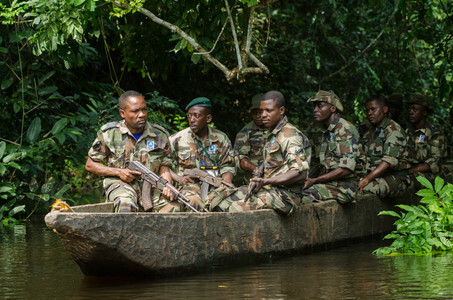 Rangers regularly receive training in new skills, as a permanent eco-guard training facility has been set up, with funding provided by the US-based Richardson Foundation. Illegal bushmeat hunting poses a threat to the park’s wildlife. The major threats include commercial and subsistence hunting for bushmeat, elephant poaching for ivory and the construction of roads on the periphery of the park, which exacerbates the problem of poaching as it provides easy access to the previously isolated forest. When African Parks first took over management of Odzala, the central area of the park had not been patrolled for several years. As a result, poacher camps were established in many of the baies, as the wildlife that visited these areas for minerals and salt were easy targets. This had a major effect on the behaviour of wildlife, with animals only visiting the baies in the relative safety of the night. Since then, African Parks has implemented an effective and targeted anti-poaching plan to address threats to the park. Technology has been introduced to enable effective communication. Wildlife habits have changed completely since the introduction of effective law enforcement, particularly in the baies where rangers have carried out general habituation. Gradually animals have become used to the presence of humans without perceiving them as a threat, which is an essential part of developing the areas as potential tourism sites. In addition, patrols have resulted in a number arrests and successful prosecutions. Former poachers had the opportunity to apply for the park’s ground-breaking amnesty programme. Poachers who entered the amnesty programme were required to hand in their illegal weapons and provide written statements detailing their poaching crimes. They were then invited to take part in a selection and training programme for new eco-guards in the park. Not only did this result in the recruitment of a number of rangers, it also provided the park with vital intelligence and numerous illegal firearms were taken out of circulation.